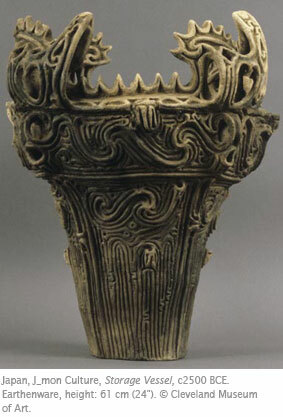 As I’ve written before, ceramic arts in Japan are among the oldest on Earth, dating back to the Jomon Culture (dates to ca. 11000 bce, flourished ca. 3000 – 200 bce). The reason I bring up Jomon ceramics is that they are the first ceramics known to have been decorated purely for aesthetic rather than utilitarian purposes. The idea of ceramic vessels serving aesthetic purposes has persists to the present day in cultures around the world. It is particularly compelling in Japan, where the ceramic tradition has such a long history. 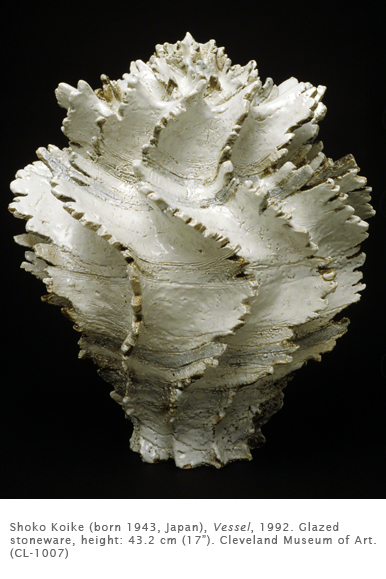 Shoko Koike is one of the first generations of Japanese women to become major ceramic artists. Before the 1950s, ceramic arts were dominated by men. Like most other art forms in Japan, ceramics followed the tradition of master and apprentice with guilds often named for a famous ceramic artist. Women were discouraged from participating in the art form. Those who did were by and large disregarded. It was only after World War II (1939–1945) that women were admitted to Japanese art schools and kilns. It is interesting to note, in contrast, that in the West as early as the nineteenth century women were encouraged to take up “art pottery” as an artistic form of expression, mostly because they did not have to attend art school and be subjected to “inappropriate” forms of education such as life drawing. In the case of the “art pottery” artists and Japanese ceramicists such as Koike, the art form has flourished and pushed the boundaries of traditional ceramics. Koike takes the sea as the point of departure for her forms. Many of her works are inspired by either the forms or texture of sea shells. She creates her forms out of Shigaraki clay (stoneware). The body is first thrown on the potter’s wheel, and then she creates the distinctive organic shapes by hand. The stoneware is then covered with a white slip (liquefied clay) with the edges, such as this vessel, emphasized with iron brown glaze. Koike’s work is in collections internationally. She has been honored in Japan with the prestigious Japan Ceramic Society Award. Activity: Mold-formed vessel. Direct students to press of slab of clay into a Styrofoam bowl (which is reusable as long as they are not cracked from students pressing too hard). Separate the clay from the bowl with plastic wrap (also reusable). Trim clay from rim that goes past the edge of the bowl. Remove the bowl and decorate the surface of the clay with found objects, clay tools, or even a pencil. Bowls can then be fired and glazed, or painted with watercolor. Yes, I agree with you. 2 years ago I had the opportunity to attend an exhibition of things made ​​from ceramic by popular artists from Japan. This is something phenomenal.